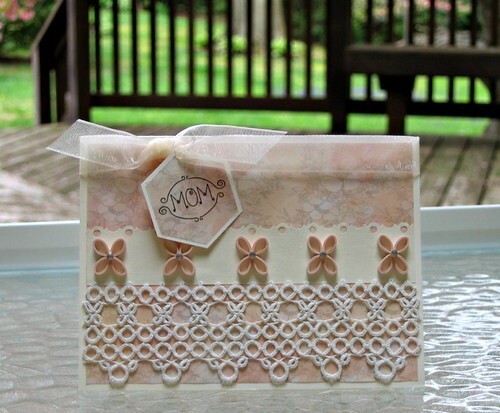 Two weeks before Mother's Day means there probably aren't enough days remaining to make a quilt or whatever big project you've had in mind, but there is plenty of time to make a quilled card. Granted, it helps to have a pretty piece of lace on hand. My grandmother loved to tat and after creating this wide lace border, she sewed it onto a pair of pillowcases as a wedding gift for my husband and me way back when. The cases had seen better days and the tatting was beginning to fray in a few places, but throwing it away wasn't something I wanted to consider. Instead, I snipped it off and saved the best parts, knowing I'd find a use for it someday... and I did! 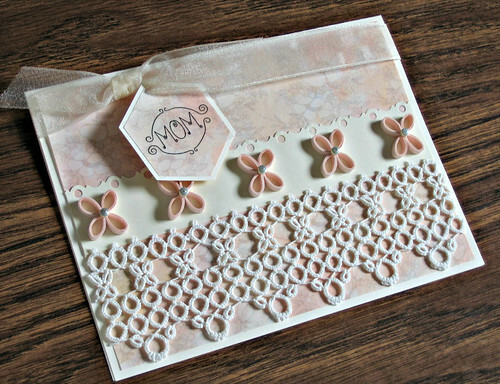 Take a look at your lace to see if there are elements within the design that can be replicated in quilling. That's how I came up with the idea of making ring coil flowers to match the tatted ones. 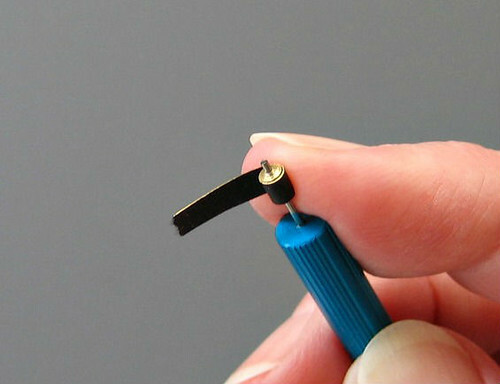 Ring coils are very easy to make.... just roll a 6" (15.3 cm) quilling strip (the standard width is 1/8" or 3 mm) or any strip you've cut from a sheet of lightweight paper, several times around a small dowel; a wooden cuticle stick, for example. Glue the end in place and pinch the coil at the glue join to make a teardrop shape. Glue together four coils with points facing inward for each flower. I adhered a piece of floral paper to a blank card, cut out a tag, and added a clear sticker, ribbon, and a scalloped strip of card stock to dress things up. Last of all, I glued on the tatting and quilling. Tweezers are invaluable when handling quilled flowers. Spread a very shallow puddle of glue on a palette - I like to use a plastic lid - and touch the underside of the flower to the glue and place it directly on the card. Take care not to slide it around, as that will leave a shiny snail trail, eww. Project finito. Mom will be pleased and you will be proud. Win-win. Angelin, thank you, I'm glad you like it! 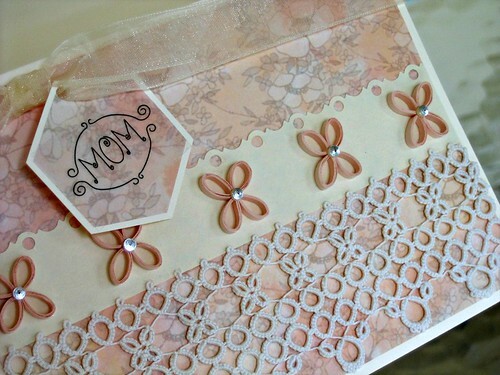 That is a gorgeous way to use your Grandmothers tatting. It is absolutely a treasure. That's so nice of you to say, April, thanks!